A Japanese civil engineering and construction firm is planning to install a “solar belt” around the moon’s equator to turn it into a giant solar panel. Shimizu says it plans on building this giant solar panel station, known as Luna Ring, by using remote-controlled robots. Luna Ring would run about 6,800 miles around the Moon’s equator and will be about 248 miles wide. 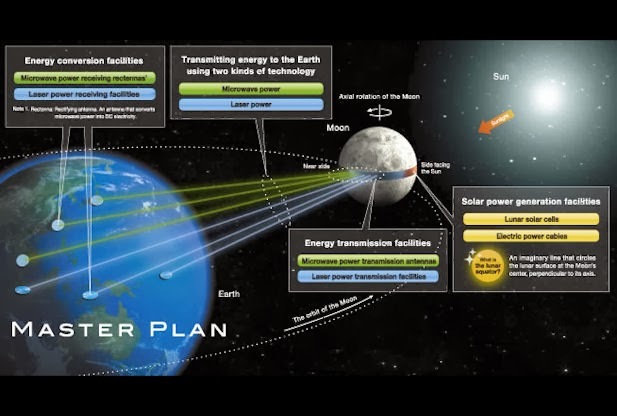 Solar energy collected by Luna Ring would be converted and beamed back to Earth through microwaves and a laser, after which it would be converted into electricity and then potentially supplied to the national grid. Shimizu says the Luna Ring could generate a massive 13,000 terawatts of energy. The microwave power transmission antennas used in this project would be about 12 miles in diameter. “Virtually inexhaustible, non-polluting solar energy is the ultimate source of green energy that brings prosperity to nature as well as our lives,” Shimizu said about the concept. The company points out that this concept would eliminate solar power inefficiency due to bad weather, and achieve 24/7 continuous power generation. 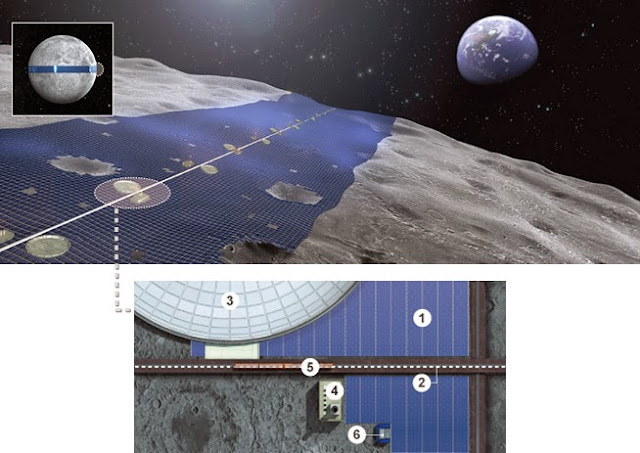 The solar belt will be made using lunar resources, according to the company. Water can be produced by reducing lunar soil with hydrogen that is imported from the Earth. Cementing material can also be extracted from lunar resources. “These materials will be mixed with lunar soil and gravel to make concrete. Bricks, glass fibers and other structural materials can also be produced by solar-heat treatments,” Shimizu said. The remote-controlled robots will be operated 24 hours a day from Earth as they perform various tasks on the lunar surface, including ground leveling and excavation of hard bottom strata. Machines and equipment from Earth will be assembled in space and landed on the moon for installation. Shimizu also said astronauts will support robotic surface operation on site. The company is planning to have a pilot demonstration by 2020 and to begin construction by 2035, assuming adequate funding is met. Shimizu has also proposed a concept for lunar bases, which it says will be an important component of space infrastructure. These bases would be constructed using concrete from lunar resources and would be shaped in a hexagonal column. The lunar base concept also requires robot construction systems on the moon. The company did not link the technologies between the lunar base and the solar panel project, but both concepts use similar proposals.